Hot Toys continues to release great Star Wars figures, and the recent Emperor Palpatine is no exception. They do pretty well on the original trilogy figures, and this Emperor goes perfectly with the Royal Guard and Vader figures. 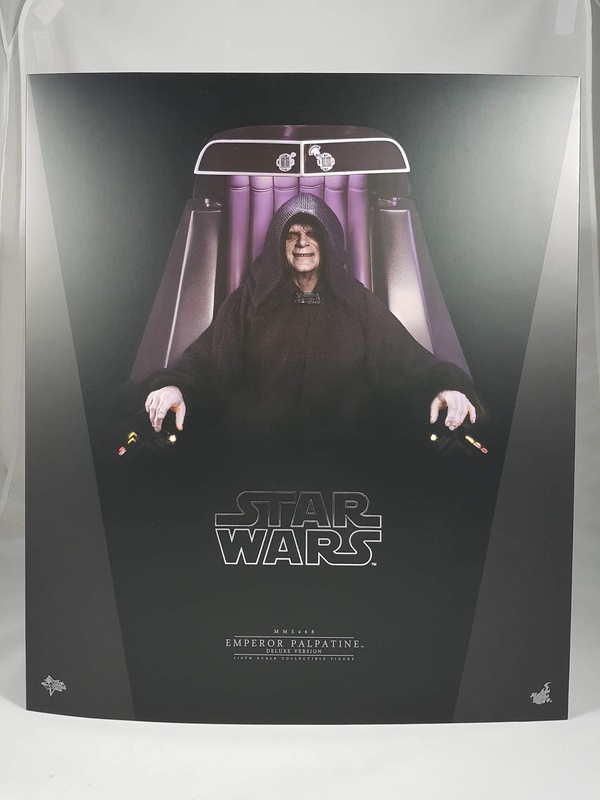 Box art is the usual style, this time being pretty large with the inclusion of the throne in this Deluxe set. The accessories aren't too extensive, but I guess the wasn't much to the Emperor in Return of the Jedi. I won't be posing him with his force lightning accessories, and they are a bit of a pain to place with the fingers. I do like the glossy black cane, but again won't be using that either. The key accessory for me is of course the throne itself. The throne looks quite nice, but could be a bit on the small side. The light up features are pretty useless too, but I think the biggest fault is that the base sits too high. This means it's an absolute pain in the arse to get him seated in the throne and have his feet touching the ground! Having the Emperor look like a school kid sitting in a large chair just doesn't look great. The best that I could do with the articulation of the figure almost got the feet there. You definitely have to use as much of the ab crunch as possible, and angle the head down as far as it can go. Bend the legs and knees enough to get him slouched in the throne and you should be able to get it decent enough. Pointing the feet downwards also helps with the illusion. The other difficult thing with him seated is getting the hood of the cloak to remain low over his forehead. Due to the slouched pose and the stitching of the hood, the tends to ride back up his head, revealing too much of his forehead. He looks much more menacing with the hood low. I'll have to keep futzing mine to try and keep it low. Other than those complaints, overall I think it looks great. The costume material is nice, and Hot Toys did a great job with his clothing under the cloak. It's a great soft material and luckily doesn't hinder articulation too much. The cloak is a nice reflective material, but does take a bit of work to drape naturally over his arms and body. I tried as best I could to match the scenes from the movie showing him in the throne. in the end, it looks pretty good on display with the other imperial forces. If you're a Star Wars original trilogy fan, then I'm sure you'll love this figure. Catching up on the website as always! Earlier in January I received the double haul of MP-36+ Megatron and MP-29+ Shockwave. And this new Shockwave darker repaint is definitely the one to get if you're after a G1 Shockwave figure! 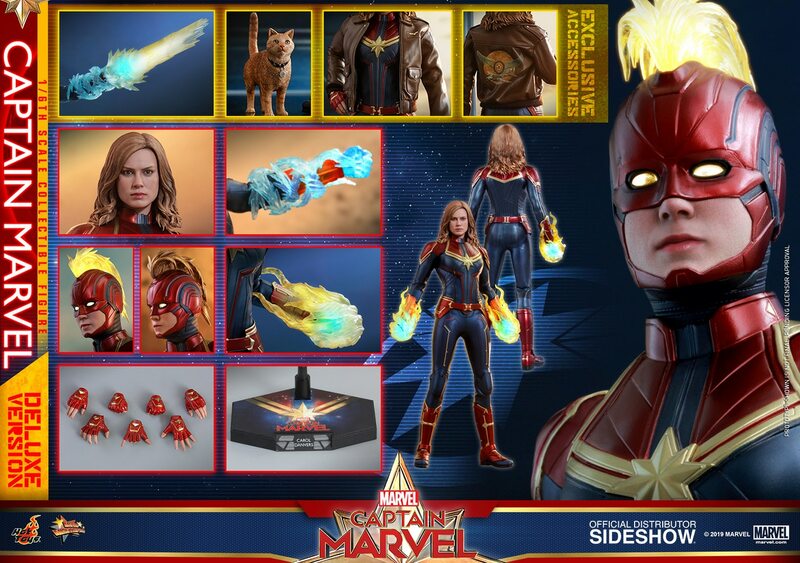 Packaging and contents are as expected for the figure. All the various hands are now a darker shade to suit the figure. I still prefer the transluscent versions just to give the figure a bit of difference rather than the flat plastic style. I especially like the new mini-Shockwave gun that now includes a transluscent tube for the chord instead of the string like chord on the original version. But of course the best part for me for this new repaint is that it has actual tampographed insignias instead of the ridiculous stickers on the original. Sure that gave collectors the option to place them where they wanted, but for me, figures in this series and in this price range should never expect collectors to place stickers. The transformation sequence is still nice and not overly complex. This new one feels almost a bit sturdier too, especially around the hip/ab crunch area which feels tighter and more secure than the original. It's interesting to note the little differences, such as the slighlty smaller eye in the head sculpt. The darker orange and smaller circumference actually help to give him a more sinister look, which I think suits the character well. The darker purple and greys around the thighs/feet also give him a more premium look. The original colour was certainly accurate to many scenes in the cartoon, but the darker colour also matches some episodes. But on the shelf, the darker plastic simply looks better is most normal lighting conditions. I normally keep my repaint versions in alt mode, with the original in bot mode. For for the MP-29 mold, the new MP-29+ simply looks so much better in bot mode. Poseability is still pretty nice, and remember to use that undocumented little elbow articulation trick (see my video for the demonstration) to get that extra bit of elbow range for the salute pose. I'll keep the original in gun mode to display next to the amazing MP-36+ Megatron toy repaint. It was a rather disappointing end to 2018 with only repaints released for G1 styled MPs. I really do hope that 2019 brings a few new molds and characters to the series!